BANGKOK - The Thai capital needs 1.2 million sandbags to construct a 3.7-mile wall within 48 hours to keep encroaching floods from swamping into the city, Bangkok's governor said Monday night. "Every second counts," said Sukhumbhand Paribatra, whose call for city residents not to let down their guard posed a contrast to government statements in the morning that the flood threat to Bangkok appeared to be easing. Sukhumbhand said barriers had to be built up at several canals carrying overflow water from Pathum Thani province just north of Bangkok, where soldiers joined volunteers in trying to save the country's oldest industrial estate from being inundated. Sukhumbhand has consistently taken a more cautious view of the flooding threat than the government of Prime Minister Yingluck Shinawatra, who also heads a rival political party. Officials in charge of fighting the flood had suggested earlier Monday that Bangkok would be spared thanks to the city's complex system of flood walls, canals, dikes and underground tunnels that help divert vast pools of runoff south into the Gulf of Thailand. Relentless monsoon rains that began in late July have affected two-thirds of the country, drowning agricultural land, swamping hundreds of factories and swallowing low-lying villages along the way. The nationwide death toll has risen rose to 307, mostly from drowning. Outside the capital, thousands of people remain displaced and hungry residents were struggling to survive in half-submerged towns. The military has been mobilized to help deliver relief supplies to stranded residents. The potential economic costs were underlined in the effort Monday to save the Nava Nakorn industrial estate in Pathum Thani, Thailand's oldest factory park. Shortly after noon, the government's Flood Relief Operation Center ordered all factories there to halt work and prepare their workers for evacuation after water started to break through makeshift barriers erected over the past few days. Officials later said they managed to limit the flooding to under 10 percent of the estate, and had the situation under control. At least four other major industrial parks have been inundated, leaving upward of 100,000 workers idle and disrupting supply chains, especially in the automotive and electronic industries. The Labor Ministry said that more than 260,000 people had lost jobs and 6,533 businesses nationwide had to close due to floods in the period Oct. 10-12. 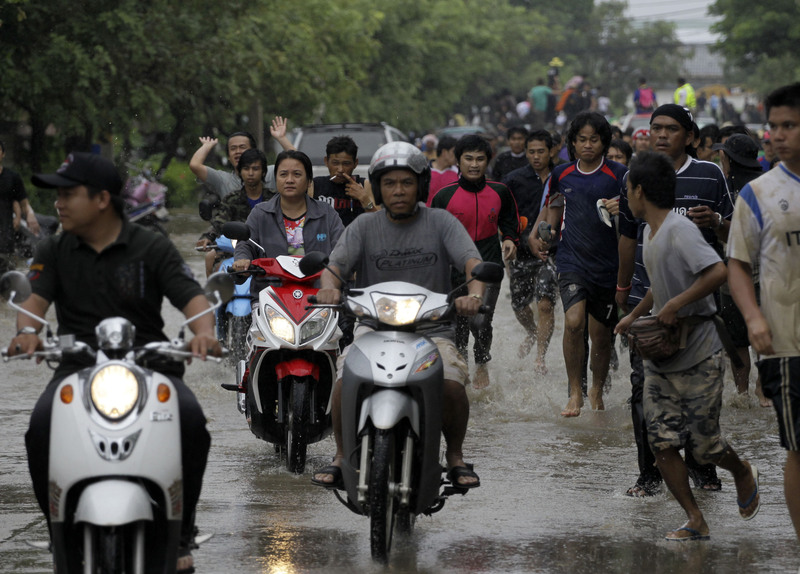 Thailand's Central Bank last week estimated that the total cost of the floods could be 100 billion baht ($3 billion). The flood center's spokesman, Wim Rungwattanajinda, said 200 buses and trucks were mobilized to take evacuated workers to emergency shelters, including a huge temple complex belonging to the Dhammakaya Buddhist sect that could house as many as 5,000. Companies with operations at Nava Nakorn, which was established in 1971, include Japanese watchmakers Casio and Seiko, the Swiss powdered milk and food producer Nestle, Japanese electronics firm Toshiba and hard drive maker Western Digital, which has already lost another production facility at another industrial park. Western Digital issued a statement saying its other facilities in Malaysia, Singapore and the U.S. are fully operational, but that it "now expects that the flooding of its Thailand facilities, combined with flood damage to the company's supply chain in Thailand, will have significant impact on the company's overall operations and its ability to meet customer demand for its products in the December quarter." The biggest blows were suffered by Honda and Toyota for whom Thailand is a major production base. Both have been forced to stop all work here due to flooding of their facilities. Many of the factories in flooded industrial estates are producers of specialized components, such as parts for computer hard drives, producing a knock-on effect for manufacturers in other areas unaffected by flooding that are unable to source needed parts. Last week, a Japanese trade organization criticized the Thai government for allegedly failing to provide timely and accurate information about the situation in the central province of Ayutthaya, where hundreds of factories have been devastated, including electronics makers and automotive parts suppliers. "Japanese companies didn't know what was happening or which information was true or not," said Seiya Sukegawa of the Japan External Trade Organization Thailand. "They received warnings but not enough information and not enough time to decide the next step."